It's prime camper time and I have had this project on my mind ever since we bought our little Jayco Kiwi travel trailer a few months ago. The propane tanks were ugly. 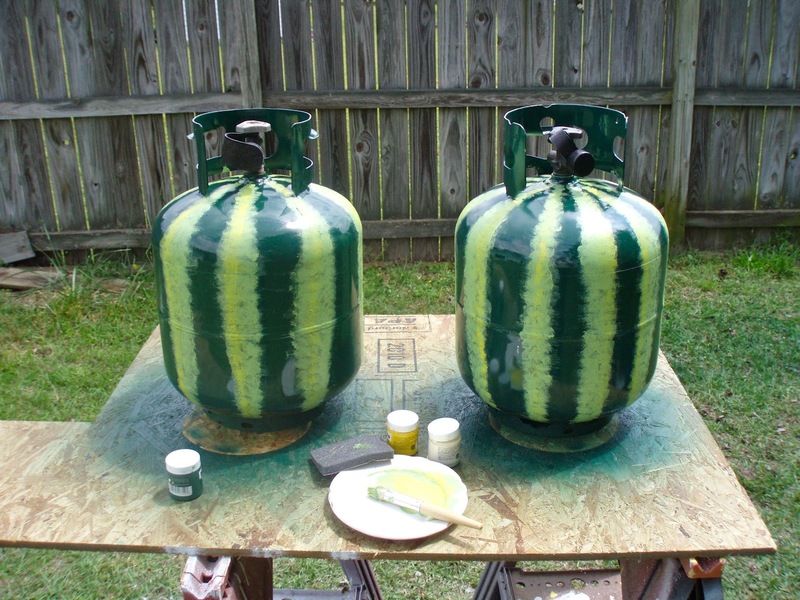 I saw a picture online of someones clever idea to paint their gigantic home propane tank to look like a giant watermelon. It was so cute, so I figured I could do it too! First I started with cleaning off the old tanks with soap and water. Then I taped off the valves at the top. You DO NOT want to get them gunked up with paint. I gave them a nice base color of dark green spray paint. I used RustOleum exterior enamel. No need for priming this way! Then I dug around in the huge craft box that my mom gave me. It contains almost anything a person might need for crafting. I found 3 little jars of interior/exterior gloss enamel paint in just the right colors. Mom's craft box is magical like that! And there just happened to be a stippling paint brush. The stripes were easy. I made a light green color with the white and dark green paints. This color was applied first in a tapping motion. Kind of like sponge painting. Actually an old sponge would have worked too. Then I finished it off with accents of bright yellow. I really like how they came out. Easy too. Eventually I will get a pic of them on the camper! How many coats of the base color did you use? 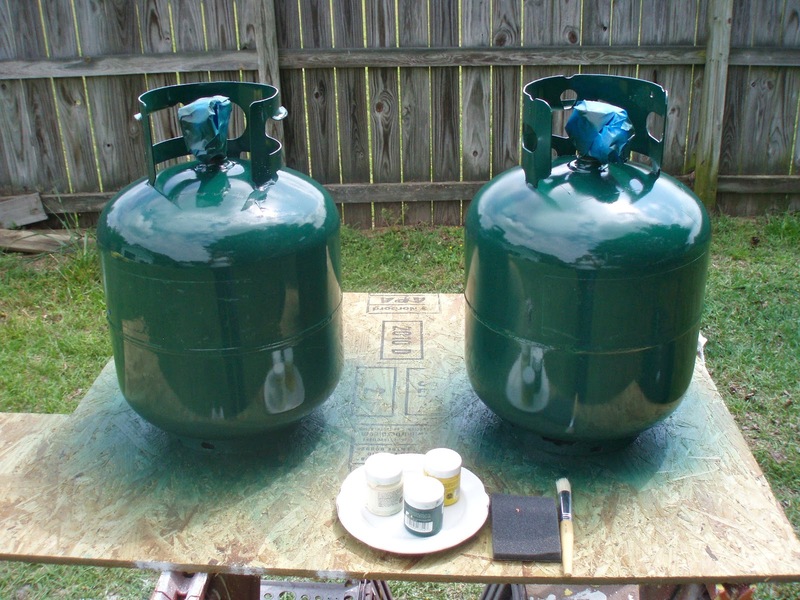 Have you had any problems with the paint peeling or bubbling since the tanks are outside? Thanks!